Veteran Charleston lawman, retired U.S. Marshal and former Charleston police and Charleston County detective Fred Stroble died February 2. He was 80. Stroble, who grew up on North Nassau Street in the upper-peninsula community of Charleston’s Eastside, was the youngest of seven children born to the late Reverend Marion and Ruth Stroble. He attended Henry P. Archer Elementary School and graduated from Burke High School. He attended LaSalle University and later served four years active duty in the Navy followed by six years in the Naval Reserve. Stroble joined the City of Charleston Police Department in 1962 as a patrolman. In 1964 he became the first Black motorcycle officer. Later, he worked as a detective with the vice squad. In 1969, he joined the Charleston County Sheriff’s Office as the first Black deputy sheriff. In 1972, he joined the U.S. Marshal Service to become the second Black Charlestonian to enter the service. In a 2005 interview, Stroble put into context his service with the U.S. Marshall Service. He noted that in 1789, President George Washington appointed the first 13 U.S. Marshals. In 1960, President John F. Kennedy called on U. S. Marshals to assist in the integration of southern public schools. Kennedy was advised by the governors of several of those states that while he sought U.S. Marshal Service assistance in integrating public schools, the service itself was not integrated. Kennedy called upon his brother Robert Kennedy, who was then U.S. Attorney General, to investigate the status of integration in the marshal service. Robert Kennedy learned there were no Black U.S. Marshals in the south. Kennedy ordered the U.S. Justice Department to recruit Black law enforcement officers willing to join the marshal service. Among the Black law enforcement officers recruited were Cambridge Jenkins of Charleston, Cecil Goins of Raleigh, N.C.; Arthur Worthy of Montgomery, Ala.; Elijah Hill of Birmingham, Ala.; Paul Underwood of Knoxville, Tenn.; and Verney Kennedy of Greenville. S.C.
Stroble served with the U.S. Marshal Service 23 years. He served on special assignments in every state in the United States, including the U.S. Virgin Islands and Puerto Rico. The Watergate Trial in Washington, D.C. was among his assignments. He was one of four hundred U. S. Marshals sent to Boston, Mass. during school desegregation. By the time of his retirement in 2008, Stroble had served in law enforcement for 46 years. Stroble received numerous awards, including the Carter G. Wilson Award for Outstanding Community Person from the Association for Study of African American Life and History, the Phillip Randolph Award for Outstanding Lawmen, and several United States Attorney General Awards for Special Achievement. Stroble and his wife Bessie Rollerson Stroble had three daughters – Cheryl Stroble, Winifred Stroble Rouse and Yolonda Stroble Mason. He is survived by his daughters, six grandchildren and one great-grandchild. 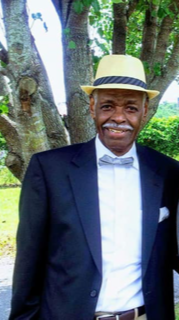 The viewing for Stroble will be 6 p.m. – 7 p.m. February 7 with family time following 7 p.m.-8 p.m. at Morris Brown AME Church, 13 Morris St., Charleston. The funeral service will be 11 a.m. February 8 at Morris Brown AME Church.